Sir Alan Michael Sugar was born on 24 March 1947 in Hackney, a poor area in East London. He went to the Brooke House School in Upper Clapton. After leaving school at 16 he started selling car aerials and electric goods out of a van he bought for £100. A year later he met his wife Ann; they have been married for 40 years. Now his fortune is estimated at £830 million. How is it possible to earn such an enormous amount of money in less than a half-century? Sir Alan Michael Sugar is the epitome of the self-made businessman. The biggest part of his fortune comes from his entrepreneurial activities: he indeed created four companies. The first one, created in 1968 at the age of 21, is named Amstrad, an electronics company selling manufactured hifi-systems. The name is in fact an acronym featuring his initials (Alan Michael Sugar Trading). In 1980 his company was listed on the London Stock Exchange. In 2008 he decided to stand down from his post as chairman. He then founded Amsair, now run by his son, a firm which offers business and executive jet charters. Amsprop and Vilgen Ltd are his two smaller firms. These economic activities enabled him to take part in Premier League football activities. In 1991 he indeed saved Tottenham Hotspur FC from failure by becoming the Chairman’s club. He was nevertheless more interested in money than in the club’s results, which made him very unpopular amongst the Spurs fans. In 2001 he eventually gave up his sporting ambitions. In addition to his commercial and sporting activities he has also become a popular TV figure. He has indeed been starring in the BBC reality TV series The Apprentice since 2001. The concept is the following: candidates compete to become Alan Michael Sugar’s new employee. At the end of each episode, a new candidate is made redundant (he then utters the famous "You're fired!"). Alan Sugar is well-known for his harsh put downs towards the candidates. One example can be the famous answer “Fair? The only fair you’re gonna get is your bloody train fare home!” In fact it is worth noting that the concept is based on the American version of the program, starring Donald Trump. 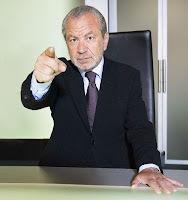 All in all, what makes Alan Sugar an icon? On the one hand, he is the prototype of the self-made man: born in a modest middle-class background, he built a commercial empire and is now the most talked about entrepreneur in Britain. In 2000 he was knighted for services to business. On the other hand, his appearances in the TV programme The Apprentice have also made him into an incredibly popular man. I've got a nice parody: the Apprentice trailer matched up with Star Wars shots. It's particularily effective and funny! Watch the video now!